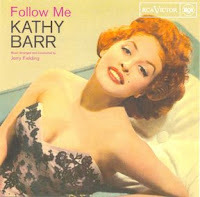 Here is an exciting song performed by the today almost forgotten singer Kathy Barr. Born Marilyn Sultana Aboulafia in New York of Turkish ancestry, this flaming redhead was recorded by RCA on the recommendation of Mario Lanza, who had heard her sing. She was a soprano who made several records of popular music, and appeared in radio, television and nightclubs. Enjoy Kathy Barr's style and let's follow her!